"It maybe is better for me moving on," said the former Celtic man. 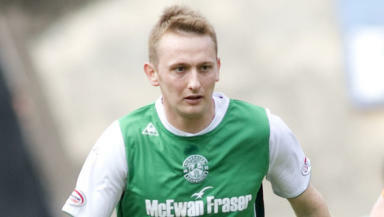 Hibs forward Derek Riordan scored in the loss to Aberdeen what may prove to be his last goal for the Leith club. The striker’s goal was cancelled out by Josh Magennis before Chris Maguire’s double won the clubs’ final SPL game of the season for Aberdeen. Riordan returned to the starting line-up for a match in which Hibs said farewell to former player and manager Eddie Turnbull, who was also boss at Aberdeen and died last month aged 88. After scoring his 11th of the season and his 104th goal in two spells with Hibs, Riordan was substituted with one minute remaining. Manager Colin Calderwood said it was because Riordan appears close to the exit door. The Hibs boss said: "It was so he got an ovation just in case we don't get to some agreement. "It's probably more edging towards he'll leave, I think." Riordan said: "The gaffer said he would speak to me at the end of the season. I need to wait and see what happens - it's down to Hibs now." Riordan suggested a new challenge would appeal. He added: "It maybe is better for me moving on. It depends which teams want me. "Anywhere that's a new challenge is better for me, a fresh start. "It drags on playing in the same bit all the time." Calderwood said it would be difficult to replace Riordan. He added: "It's a big hole to fill but you've got to get goals from somewhere."